This photo was taken September 2012. Flanking the Christmas decorations are Halloween costumes. At the time I Tweeted that I was divorcing Target. It didn't take. I was in Target the other day looking at things I didn't need in the home decor section* (maybe next time wall hook shaped like an elephant and useless tin bird pitchers) there was a customer who had a guilty, slightly desperate look in her eyes. "I can't believe I'm looking at this stuff already," she said to me as she sifted through holiday-themed snow globes. "It feels like it was just Halloween." Yes! YES! Complete stranger. Thank YOU! It was, in fact, just Halloween. Just two weeks ago. We still have fun-sized M&Ms and Milky Ways left in the candy bowl and pumpkins on the porch to prove it (and they will remain there, until after Thanksgiving ... and maybe a little into December depending on when I decide to cede the yard to inflatable Christmasstuffs. Hell, maybe I'll just keep them there all winter. I wouldn't be the first person in my neighborhood to be less than seasonally inclined). But to the good people at Target (and probably most other retailers in the country), Nov. 13 might as well have been Dec. 13. I joke with Brad every year in July and August that the back-to-school stuff would be gone in a second and the Halloween stuff would be put out for a couple of minutes, but secretly that whole time its Christmas. Because lining the back walls of the story and lurking in the themed aisles are tell-tale signs: tree stands and Santas and strings of lights. There's no attempt at all anymore to give us November and the time to watch the last of the leaves drift off the trees. There's no breath before the rush of the holidays. And poor Thanksgiving is being reduced to Black Friday Eve -- or worse just Black Thursday. 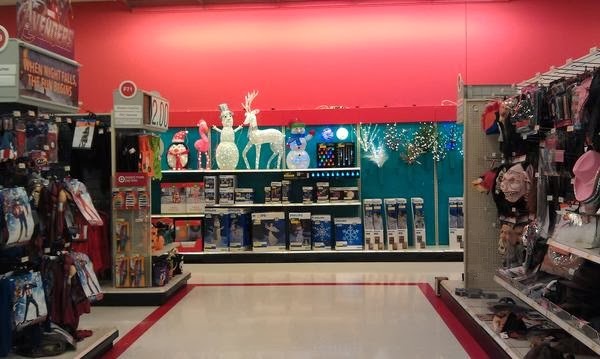 After my visit to Target I saw this report on the local news station about the holiday retail season getting an early start which confirmed all of my assumptions. In the story, they interviewed the manager of a local Walmart, which will open at 6 p.m. on Thanksgiving. “At the end of September we still had Halloween but we were changing right over to Christmas," he said. “We kind of wait until everybody comes out with there times and then we go with that so we try to be ahead of that game but I can foresee us starting on a Wednesday sometime down the future." I've ranted about this before. How we're being sold something that was never meant to be sold. And in all of the frenzy we're getting so lost and weary and defeated. I could see that in this woman's face in Target. That hole in us doesn't need to be filled with all this glittery stuff. I'm not Scrooge. I like Christmas. I look forward to watching "Elf" with Brad and taking the girls to Christmas Magic and long, giggly gatherings with our extended families. I would really just rather skip everything leading up to that moment. We got "Lady and the Tramp" for Lily last Christmas. And I find myself tearing up at the opening scene** (and not just because of the puppy -- although seeing Lady as a puppy will always remind me of the sheer joy I experienced when my dad finally relented to our demands for a puppy and picked up a box on the side of the road that contained our Meggie ... but that's another story). But because this is what I love about Christmas. That quiet moment when you can curl up in the love of your family and friends and the knowledge that you get it. That this great thing you are celebrating -- this message of love and humility and grace and generosity -- is the actual gift. And the best one at that. Maybe it's just me, but I think it's worth waiting for. P.S. My NaNoWriMo update (yes I'm still at it ... but woefully behind ... but not too worried about it because at least there's forward motion). * I should probably just avoid this entire section with its adorable, but fragile thingamawhatzits that would just end up attempting to occupy space in my home that really belongs to our overflowing collection of plastic playthings. I should really stop watching HGTV because I'm pretty sure they wouldn't count the Fisher Price Barn on my living room floor as a great accent piece that adds a nice pop of color, nor the pink Step 2 kitchen blocking my fireplace as a stylish, but functional furnishing. (Its functional insomuch as it will occupy Jovie for a good 10 minutes at 5:30 in the morning so that I can catch a couple more minutes of sleep on the sofa -- which, by the way, is a vision of shabby chic what with the forever bunching drab green slipcover that's perpetually covered in dog hair and lost pokey playthings (as I type the toy thermometer from the girls' doctor kit is dangerously close to my posterior). ** The self-conscious part of me feels that I should acknowledge the sappiness of the song and the images and how it probably plays right into the stereotypes of Christmas anyway. But then the earnest part of me really wants to beat the crap out of the self-conscious part of me because the self-conscious part of me is missing the point. So here I'll have it both ways.